Install – Post Only | SignPost Install Inc.
Do you sleep with your custom real estate panels close by? Are they individually wrapped in velvet and protected by the latest in motion detection alarm systems? Hey, we get it, they aren’t cheap and they are your brand, they need protection. Then maybe you only need this service, our Post Only installation. 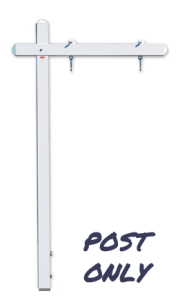 We install the post and clips for your panel and you hang the panel when you are ready. When you are ready consider letting us store and protect your custom panels. This way we can install it all for you. check out our Post Plus+ Service. *The installation post rental period is a 1 year term or until the listing is sold or withdrawn, whichever comes first. If your listing requires an extended term after the fist year we have very low term extension fees in 6 month increments. Please review our Lost, Damaged or Unavailable Fees Page.